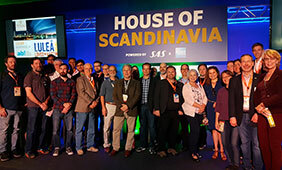 Last year's participants from Sweden post with IC² staff and Austin Technology Incubator director Mitch Jacobson and the Bureau of Business Research director J. Bruce Kellison. The University of Texas at Austin will bring twelve budding European companies to learn and explore with local business experts at this year’s South by Southwest Interactive Festival (SXSW), March 8 – March 16 in Austin, Texas. The UT Austin Center for European Studies (CES) and IC² Institute have collaborated to build a program — now, in its second year — that utilizes proven IC² Institute business-development methods, European relationships, and the platform of one of the world’s most prominent business gatherings to demonstrate how the innovation-rich climate of Austin can accelerate the progress of internationally driven startups. This project is funded in part by the European Union’s “Getting to know Europe” grant and United States Department of Education. Working with the Arctic Business Incubator of Sweden and other business-support organizations in Europe, CES and IC² Institute selected twelve promising companies for awards that include training, mentoring and travel expenses for a week in Austin. During their visit, company representatives will have the opportunity to attend SXSW events designed to help entrepreneurs make important connections with the IC² Institute business network, as well as receive mentoring from Austin-based business leaders and practice in pitching with experts at IC² Institute.